At age 23, Drew Philp, a rural, white kid from Michigan moved to bankrupt Detroit, a place filled with blighted abandoned houses and crime. He purchased a boarded-up 1903 Queen Anne home for $500.00. “We thought maybe, just maybe, we could succeed where our hippie baby-boomer parents couldn’t: creating the world anew. We knew they had failed—Detroit was the proof. We were a long way from ‘Yes we can.’ But there was one place people did. One place of except. That was Detroit,” Philp says on buying his home in his debut memoir A $500.00 House in Detroit. Philp chronicles an inspiring journey of how he, as a naive, young, jobless college student, became a resident and homeowner, fought to protect, grow, and add to the city in this absorbing story of the ongoing grassroots rebirth of Detroit, and the author’s own growth and maturing and empowerment. Along the way, the author overcomes frightening situations in a city that is 80% black—and where he learns to deal with fires, shootings, wild packs of dogs and more. Philp says, "It is your sacred duty to find hope somewhere, anywhere, and keep trying to make that world in which you wish to live. I don't succeed at it every day. But I try and I know I must keep trying." Philp believes it is vital to create something every day. “Despite what they may tell you, you artists, you mothers, you misfits of creativity, the world depends on what you can dream up. The ice caps aren't getting bigger. The bombs are still being produced. The cities are still being torn apart with inequality and suffering. Our very survival depends on what you can create. You. Not someone else. You." 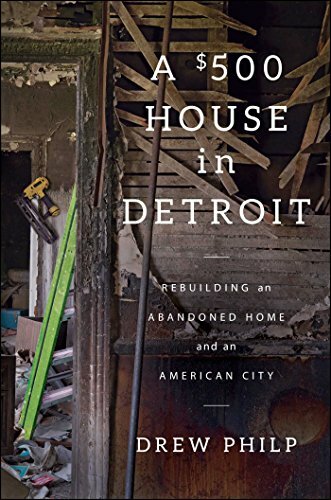 A $500.00 House in Detroit is an important and powerful memoir that looks at the struggles and great efforts being spent on breathing life into a decayed city, and delves into the complicated and diverse people trying to carve out better futures, bringing forth purpose for Philp’s generation. Philp’s exceptional story is a timeless gift to be shared and passed along. It is one that leaves the reader cheering for neighbors and neighborhoods, for playgrounds once again filled with the echoes of children’s laughter.